You will draw from observation, beginning with elementary forms and moving to more complex ones. Once you have mastered problems of composition, structure, form, and perspective, emphasis is placed on tonal variation and surface and color. Charcoal, conte, and pencil are the primary media used. This course will familiarize you with composition on a flat surface. You’ll learn to manipulate the art elements by focusing on one design principle at a time. A variety of media and techniques are explored, and craftsmanship and presentation are strongly emphasized. You’ll learn the basic materials, tools, and vocabulary of ceramics. Technical training includes hand building with coil, slab, and potter’s wheel. Functional, decorative, and expressive possibilities of clay are explored. A working knowledge of the kiln is acquired. This course familiarizes first-year students with the computer as a tool for image creation, documentation, and the web as a means to create a professional artistic presence. You will be introduced to the Adobe suite and create their own portfolio websites that will be used to feature their work over the next four years. This course builds upon the skills acquired in Drawing I while centering on the human figure as subject matter. Through the use of live models, problems of anatomy, proportion, and form are explored. Drawing proficiency is achieved through gesture drawings and sustained rendering in a variety of media. This course teaches second-year students to adapt two-dimensional design principles to three-dimensional concepts. You’ll explore structural and technical aspects of working with relief, freestanding, and modular design. You’ll learn about the fundamental techniques of printmaking. Collagraph, screen, relief, and intaglio processes are explored as well as their relationship to other art forms. You will learn the fundamentals of oil painting through still life and landscape. You will use traditional and modern materials, tools, and techniques of the medium. You’ll study the development of Western art from prehistory to the Renaissance through slides lectures and discussions. The relationship between art and society is explored. Vocabulary, museum visits, and research papers are all important parts of this course. This second level of digital art, centered around the combination of words and imagery, connects language with the formal elements of two-dimensional design. You will be exposed to typography as a design and communication tool. The concentration is on graphic design and creating works for print. This course will further develop your skills in drawing, going beyond the academic aspects. You’ll render the model in various media as they explore and develop a more personal approach and artistic voice. Building on the experiences of drawing II and painting I, you’ll bring your knowledge of paint and color to the portrait and figure. You’ll be encouraged to refine techniques and approaches and create work that explores the breadth of expression the medium affords. This course teaches both additive and reductive techniques and casting. You’ll use clay, wire, and found objects as a “sketching” media and combine sculptural processes. You will be instructed and mentored through the artist’s process of research, planning, and fabrication. This course is designed to teach the basic techniques of the camera and the darkroom. You’ll be given assignments dealing with composition, subject matter, use of light, and development of a point of view. You’ll learn the technical aspects and use of the camera, as well as proper film processing, and printing. You’ll continue your exploration of the computer as a tool for artistic expression. The class will expose you to interactive and “New Media” processes (animation, projection mapping, 3D printing) and tools. You’ll study the development of Western art from the Renaissance to the present through slide lectures, reading assignments, and museum visits. The relationship between art and society is explored. Non-western influences, such as Asian, African, and Native American art, are introduced. This course combines two-dimensional and three-dimensional media and processes using collage and assemblage as reference points. Exposed to various materials, methods and artists, you’ll be encouraged to experiment and create work that is individual, personal, and reflective. You’ll continue their experiences within the third dimension using traditional and non-traditional methods of joinery and construction to create works of personal expression. Installation, environmental, and performance art is also encouraged. 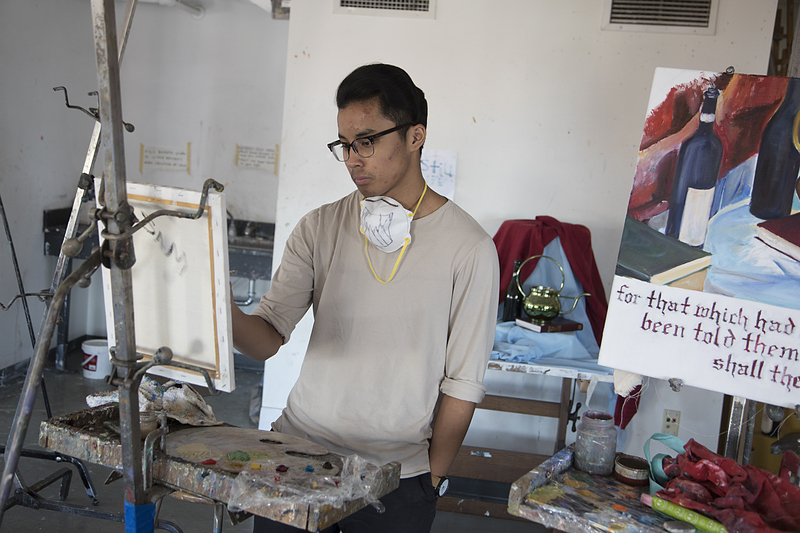 Seniors are offered two afternoon blocks of independent studio time in the areas of drawing, painting, digital art, photography, printmaking, or ceramics to create independent, or “thesis” work. Students select studios at the end of their junior year. They are expected to research and gather relevant materials during the summer and to present a formal proposal for a body of work to be created over the course of the year. Students regularly meet with staff to evaluate progress. and meet together with peers for group critiques.